In this tutorial we remove default validation and create custom validation rules. Also I will show you one trick how to replace all the default validation messages with just a single one. I already mentioned this topic in my WooCommerce checkout fields tutorial, check other examples there. When creating your custom validation, you do have to do anything in woocommerce_checkout_fields hook (I mean validate parameter of course). Just use woocommerce_after_checkout_validation to add your custom validation rules and error messages for them. Did you notice something weird on the previous screenshot? 😁 No? Do you see that the error message says that either first name or last name is incorrect, but both of the fields are highlighted in green, not in red? Much better, huh? How to implement it? Below is a very simple example for the Billing Last Name field, you can upgrade this code if you want. How to Show Only One Error Message? So, how to prevent it and display just one error message instead? I want to retain the error shown if a specific filed is empty and generate the error “Please fill in all required fields to place order!” ONLY if all fields are empty. I’m aware that there’s something wrong in my code above. Can you help me with this? I also notice that the error for the terms and conditions below the checkout form (if checkbox is not checked) was gone. Ok, it looks like some custom coding work 🙃 Please contact me and I will help you. Thank you for this one. It took me months to find this answer on how to show only one error message in checkout page. One quick question, is this also applicable to those fields in Woocommerce My Account billing address and account details? What hook should I use? No, for billing addresses there is a different hook woocommerce_after_save_address_validation, but I’m afraid it won’t work for you the same way. hey Misha! could you explain a bit more about how to implement the JS code – i don’t get if it’s needed to do both PHP in functions file and JS in Footer. Everything is explained in the tut 🙃 Please ask a more specific question. Thanks for this great article! I’m wondering if there is any possible to setup “forbidden” input for address field (billing & shipping). 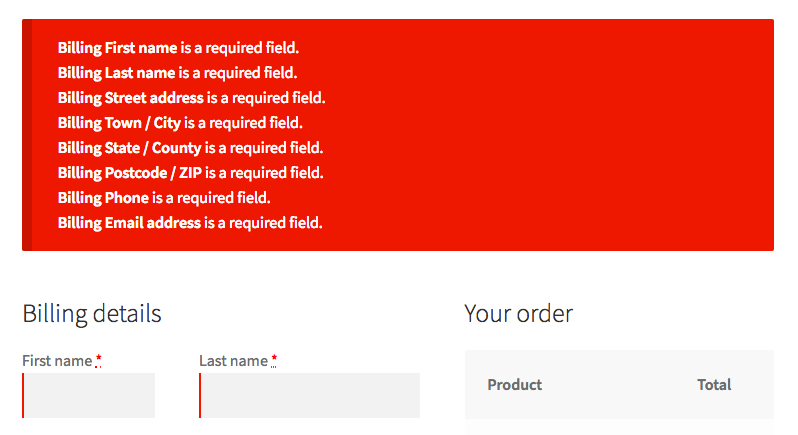 I don’t want to allow the word “Postbox” inside the address fields because we can’t ship to postboxes.